PDAC International Convention, Trade Show & Investors Exchange is the world’s leading convention for people, companies and organizations in, or connected with, mineral exploration. The four-day annual convention has grown in size, stature and influence since it began in 1932 and today is the event of choice for the world’s mineral industry. In addition to meeting over 1,000 exhibitors, 25,122 attendees from over 100 countries, it allows you the opportunity to attend technical sessions, short courses as well as social and networking events. Atlantic Canada’s most comprehensive heavy equipment show returns to the Moncton Coliseum. This is THE must-attend event for the heavy equipment, roadbuilding, forestry, landscaping, and municipality sectors―boasting a vast indoor and outdoor showcase of the latest products, services, and BIG iron. 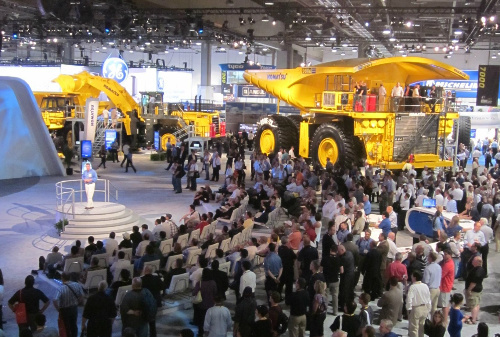 With a decade of history and growth, this massive heavy equipment show has established itself as a pillar of the industry. Visitors will be treated to many exciting features, including a brand new demo zone. A small fleet of dump trucks will deliver thousands of tons of dirt directly onto the stadium floor and equipment will dig, lift, carry, break and push, just like on an actual worksite. Founded in 1898, the Canadian Institute of Mining, Metallurgy and Petroleum (CIM) is the leading technical society of professionals in the Canadian minerals, metals, materials and energy industries. CIM has over 14,600 members, convened from industry, academia and government. With 10 Technical Societies and over 35 Branches, our members help shape, lead and connect Canada’s mining industry, both within our borders and across the globe. The International Conference & Exhibition on Mining, Material & Metallurgical Education (ICMM) is the premier event will focus on the exchange of relevant trends and research results as well as the presentation of practical experiences in mining, material and metallurgical pedagogy and education. The third International Symposium on Mine Safety Science and Engineering covers different aspects of mine safety issues ranging from rock mechanics and ground control to occupational health and safety. The largest mining show on (and under!) earth returns to Las Vegas in 2016. MINExpo 2016 is all about the solutions that make it possible for the mining industry to meet the challenges and capitalize on the opportunities in a rapidly changing world in need of metals, minerals and energy. This forum will provide information on how manufacturers, construction, equipment and service providers can access mining supply opportunities. In addition, there will be a third session on operations topics such as reliability, operations excellence, and maintenance. In order to allow all registrants the opportunity to participate in the Forum sessions, the tradeshow area is closed while the Forum is in session. Fortis Mining Engineering and Manufacturing is a mining contractor based out of Saskatoon, Saskatchewan.